MARTINIS FOR PETS - The Dog Bow Wow Martini and the Cat Purr-fect Meow-Tini! 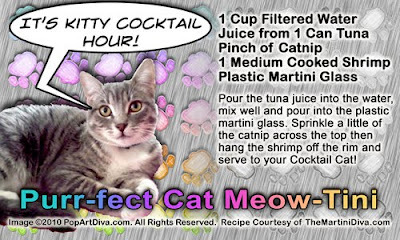 As promised here is the Purr-fect Cat Meow-Tini - A martini for your pampered cats and kittens! No, there is no alcohol in it! But there is a little bit of zing from the catnip garnish!! Now Kitty can enjoy Martini Hour with you in style! 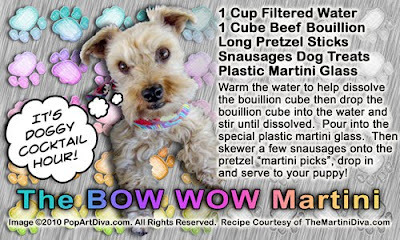 And don't forget that I also have a martini for the Canine Cocktail Lover - The Bow Wow Martini, a martini for dogs!